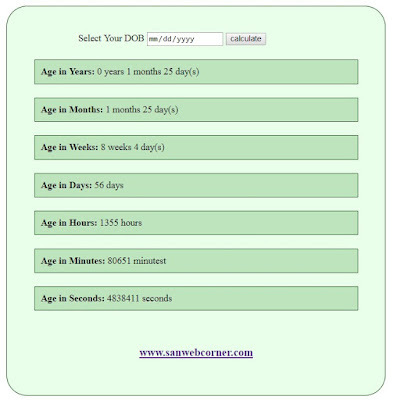 Here we will learn how to calculate age by date of birth ( DOB) using php programming. This php age calculator will calculate your age in years, months, and days as of any date of your choosing. The php calculator will also translate that age into how old you are in terms of months, weeks, days, hours, minutes, and seconds. Plus, When you select the date of birth it shows th exact ages in different format like age in years, age in months, age in weeks, age in minutes, age in seconds in the different lines. This is the time calculation by using php. The below example have the demo page check out the demo page for calculating your age in different format. Download the code from download section. I hope this concept is useful.